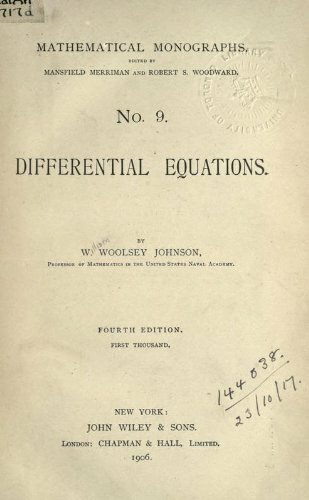 The differential equation must necessarily at first be viewed in connection with a 'primitive', from which it might have been obtained by the direct process, and the solution consists in the discovery, by tentative and more or less artificial methods, of such a primitive, when it exists. The object of this book is to give an account of the central parts of the subject in as simple a form as possible, suitable for those with no previous knowledge of it, and to point out the different directions in which it may be developed. Contents: Basic Concepts; First Order Differential Equations; Second Order DE; Laplace Transforms; Systems of Differential Equations; Series Solutions; Higher Order DE; Boundary Value Problems and Fourier Series; Partial Differential Equations.